Previewing tonight’s action…….47 years on. The Monkees and Tommy Steele weren’t the only celebrities Wolves encountered during their long hot summer in the United States in 1967. As regular long-time readers of this site might remember, they also had a brief meeting with screen star Maureen O’Hara before their game in Los Angeles against Shamrock Rovers mid-way through their victorious campaign 47 years ago. In a detailed 2009 feature by our good friend and passionate A Load Of Bull contributor Jim Heath, we used a photo of Derek Dougan meeting her and Rovers captain Frank O’Neill before kick-off at the 1-1 draw. 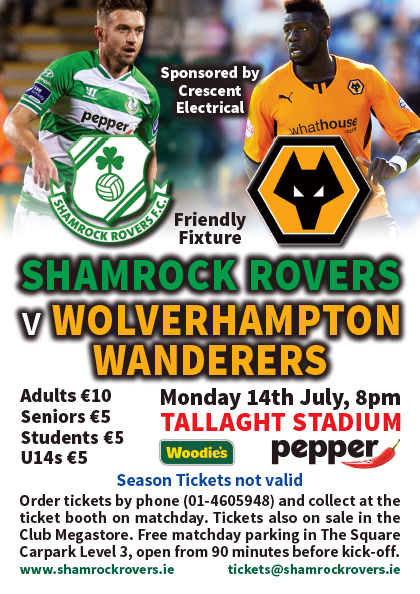 More than five years on from publication of that piece – and on the eve of Wolves’ pre-season friendly against the Dublin-based club tonight – we have been kindly contacted with more information by Fergus Desmond from the Shamrock Rovers Heritage Trust. He informed us that, far from being present just as a random photo opportunity, the red-haired star of films like Buffalo Bill, The Hunchback Of Notre Dame and McLintock!, was actually a Rovers fan from childhood. She was born in Dublin and her father Charles FitzSimons bought into the club after proving himself a big success in the clothing business. He is also shown on the photo with The Doog, which appears in the USA 1967 feature in our Tours section. Maureen, who was a long-time friend of John Wayne, didn’t confine her attendance to the LA Coliseum, where the game was played. Wearing the green and white hooped jersey of her favourite team, she also greeted the Irish squad when they touched down in the city and posed with them for photos and TV clips at the airport. She would presumably have been proud therefore to see her lads draw with a Wolves side who were already going strong in the seven-week tournament. Ronnie Allen’s men were confidently expected to register another win at the expense of a side who were without a victory in their opening eight games. But they trailed for much of the game after O’Neill struck mid-way through the first half of a clash watched by 6,936. And it was late in the day that a foul on Dave Wagstaffe – the squad’s main link with Davy Jones and The Monkees – gave Terry Wharton a chance that he accepted to equalise from the penalty spot. While Wolves won the Western Division in the tournament and went on to beat Aberdeen in a breathless final that is still talked about in Scotland, America and around Molineux, a Rovers side based for the duration in Boston finished bottom of the Easter Division with seven points from 12 games, their only victories coming at home to Brazilian side Bangu (the Houston Dynamoes) and away to Aberdeen (the Washington Whips) in their final game. 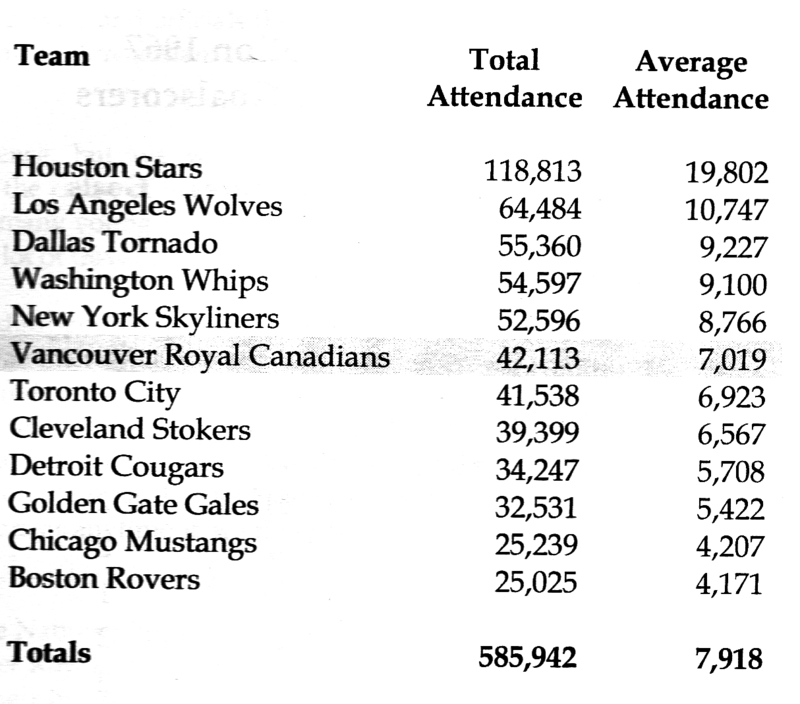 A stats panel showing that Wolves and Shamrock Rovers were at opposite ends of the attraction scale in the 1967 USA tournament. Rovers competed in the European Cup Winners Cup in 1967-68 but went out in the first round to Cardiff. Over the next two years, they were eliminated at the same stage by Randers Freja, from Denmark, and Schalke 04. Among their 1967 squad was full-back Paddy Mulligan, who later played for Chelsea, Crystal Palace, Albion and the Republic of Ireland national team. * We are indebted for bits of background information in this piece to Ian Thomson and the ‘Summer Of ’67’ book we publicised several months ago. Posted on: Monday, July 14th, 2014.